posted by Lisa Ace in community, Outreach, Free food, clothes, shoes. posted by Michael S. Cole in fall, community, batavia. I have Batavia on my mind this12th day of October. (officially,Columbus Day) The Fall Colors, Leaves falling, Burning Wood, Pumpkins, Corn Stalks, Blue Devils Football, Olivers Candies, The Red Barn, the Checkerboard Restaurant,Batavia Downs Race Track,The Pok-A-Dot, WT. Grants,JJ Newberrys,Buster Brown Shoes,The News Store,Montgomery Ward,Pontillo's Pizza,The YMCA,Charles mens Shop,O-AT-KA Milk,Miss Batavia Diner. The memories will live inside forever, the friendships forged, the ones we lost along the way, for those that still reside in this wonderful community" stay blessed" as no one knows of the wonderful gem of a community that it truly is. A Batavian Forever! posted by James Burns in Oatka Creek, Le Roy, community. The Oatka Festival continues today, in Le Roy, until 6 p.m. This morning started with a 30K bicycle race and a fishing derby. The festival concludes with the Vietnam Veterans' Annual “Duck Derby” at 5 p.m.
Jackson waiting for the big one. Another Mackenzie with her fish. posted by Traci Turner in batavia, community, education, City Schools, schools. Diane Reed with a group of faculty and members from the community. 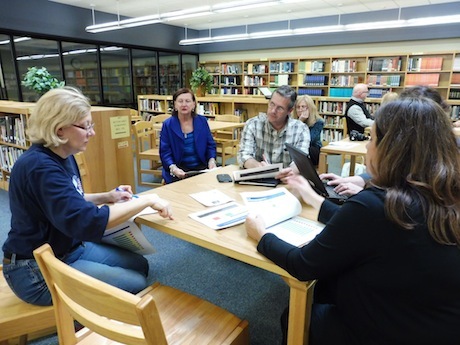 The Family Engagement Survey results from 2014 were presented at the Batavia High School Library during their "Data Café" Tuesday night. Diane Reed, Ph.D., the Batavia City School District’s outside educational expert and associate professor in Educational Leadership at St. John Fisher College, shared the data from the community survey taken by families and other Batavia residents last fall. Reed is certified by the New York State Education Department to work with Focus Districts to help determine school effectiveness and discuss strategic plans with faculty and community members to improve it. The community survey is one of three that make up the Data Triangle Survey. It was based on six tenets to measure effectiveness which include District Leadership and Capacity, School Leader Practices and Decisions, Curriculum Development and Support, Teacher Practices and Decisions, Student Social and Emotional Developmental Health, and Family and Community Engagement. The survey was composed of 50 statements and participants answered using a Likert scale. The total number of people who took the survey was 374. According to Reed; the low response rate is typical. The overall data total results for the district showed that 75 percent or more of participants answered each of the 22 statements with either strongly agree or agree. These results are considered an asset. For each of the other 28 statements, 50 to 74 percent of participants answered strongly agree or agree. These results are considered an emerging strength. The overall data total results for the district also revealed no fewer than 50 percent of participants answered strongly agree or agree to any of the statements. These results show no possible risks for the district. When breaking the statement results up by schools, the Batavia High School showed minimal possible risks. Faculty members and parents divided into two groups to discuss the district’s strengths and weaknesses based on the survey results. Both groups came to the conclusion the district could improve on providing the community with more training on Common Core learning and positive engagement with students outside the classroom. Jean Berry, mother of two boys who attend Batavia Middle School and Batavia High School, really enjoyed how teachers sent home postcards when her children were doing well in school. One suggestion she had was to use lexiles -- reading level measurements -- more effectively. “When we have the Scholastic Book Fair, the books should be labeled with lexiles so I can buy the appropriate books for my sons’ reading level,” Berry said. Moving forward, the district will consider hosting additional Common Core informational nights to help the community understand the standards especially at the secondary level. They also will encourage teachers to make positive calls home to help motivate students. posted by Maggie Nichols in community, dinner, free, all ages. Free community dinner at Indian Falls United Methodist Church 7908 Alleghany Rd. Corfu. For more information call (585)762-9105. All are welcome. posted by Michele Lawson in community, food, free, Care-A-Van, Foodlink, pantry. posted by Michele Lawson in community, food, free, Care-A-Van, Foodlink, food pantry. posted by lucie griffis in community, Le Roy, LeRoy Winterfest, Announcements; food; fundraiser; community; service. LET US COME TOGETHER AS A COMMUNITY THIS HOLIDAYS SEASON! SAVE TIME. SAVE GAS. CATCH UP WITH FRIENDS. ALL ARE INVITED TO CAROL! HOT CHOCOLATE SUPPLIED BY SPIRITS! All businesses will be offering in-store specials and gift certificates! Wrap up the savings shopping and supporting local! posted by Michele Lawson in community, food, free, Foodlink, pantry. posted by Michele Lawson in batavia, austin park, community, free, Care-A-Van, Care-A-Van Ministires, cookouts. Care-A-Van Ministries, Inc., a community-based street ministry, has just ended its 2014 cookout season at Austin Park. These free cookouts were held every Thursday night from May 15th until September 18th and encompassed nineteen cookouts and totaled 6,426 free meals served during the summer. The number of free meals served this year increased substantially over 2013 when 4,936 meals were served. These meals, funded by the generous donations of the supporters of Care-A-Van Ministries, helped feed many children, families, and individuals throughout the summer. Each week a different Pastor from a local church delivered an inspirational and encouraging message of hope and salvation from the Word of God. These messages were a blessing to those attending and many were able to receive prayer and spiritual support from these pastors and the various church/ministry organizations present at Austin Park. Also in attendance during these cookouts were The Salvation Army, Living Waters Apostolic Ministry, Eagles Fountain Fellowship, United Methodist Church, Smoke Free NOW, Syd’s Characters, Total Freedom, PC Publications, MSCF, Elba Baptist Soccer, SNAP, Ride2Recovery Ministries, the Mental Health Association, GCASA , Truth Ministries, Fidelis Care, and the YMCA who generously provided a bounce house at the cookouts. The Care-A-Van Band, composed of community members and members of a variety of church worship teams, performed classic and contemporary worship songs and melodies; additionally, the cookouts were also blessed to have local worship teams and musicians stop by and lend their musical talents to these events. Volunteers from different churches and individuals from the community supported the cookouts by providing invaluable manpower to staff the food tables, grills, and assisted in the setup and teardown at these events. The ministry wishes to thank the City Council and City Manager Jay Molino for supporting our cookouts at Austin Park and the work of the ministry in the community as a whole. We would also like to thank the City of Batavia Fire Department whose firefighters were always friendly and helpful during their weekly inspections; the City of Batavia Police Department officers whose professional attitude is a testament to their department; and the City of Batavia Building and Grounds department who always ensured that the pavilion, bathrooms, and gates were ready for our use. Together we can make a difference in our City and the ministry looks forward to the 2015 cookout season and hopes that everyone had an opportunity to stop by this summer. Care-A-Van Ministries continues to be out in the community every Thursday night during the winter in different neighborhoods of Batavia with our bus ministry; on Saturday mornings with our prayer, food, and clothing distributions; and Monday through Thursday mornings with our bus prayer and encouragement ministry. Stop by to see us if you are in need or would like to see the ministry in action!!!! For more information on Care-A-Van Ministries, please visit our website at www.cavministries.org or visit us on Facebook. posted by Michele Lawson in community, food, free, Care-A-Van, Foodlink, pantry, St. Paul Lutheran. MOBILE FOOD PANTRY October 22nd 2014 5 pm – 7pm St. Paul Lutheran Church 31 Washington Avenue, Batavia NY 14020 Care-A-Van Ministries is partnering with St. Paul Lutheran Church and FoodLink of Rochester to host a mobile food pantry. The exact food items available are not known, but fresh produce will be available. The Mobile Food Pantry is available to Genesee County residents only. There is no income verification required, but you must be 18 years old to pick up food from the pantry. Please provide your own bags/cart/vehicle to transport items to your home. posted by Julia Ferrini in batavia, community, Care-A-Van Ministries, Vibrant Batavia, block party, Lewis Avenue. Sunlight danced on the leaves while music stirred a sighing breeze, time seemed to stop for awhile as neighbors eased into languid conversation and lilting laughter. Lewis Avenue was the gathering place Saturday evening in what was the first block party for this tight-knit community. As part of the event, a proclamation on behalf of Brooks Hawley and the City of Batavia was presented to both Stephen and Mike Rosenbeck of Lewis Avenue for their ongoing efforts of keeping the neighborhood together. “Stephen and Mike have provided outstanding public service, selfless acts of charity, compassion and genuine concern for their fellow Batavians,” Hawley said upon presentation of the Good Neighbor Recognition Certificate. Leanna DiRisio, community organizer with Vibrant Batavia, partnered with Paul and Bridget Ohlson of Care-a-Van Ministries to make the block party a community event. “Our mission is to bring communities together and open lines of communication,” DiRisio said. Bellamy moved to Lewis Avenue in May 2009 from Kent County, England. He and his wife, Kathryn (Katie), moved stateside to be closer to Katie’s family, who live in the Batavia area. There are many services a city has to offer and DiRisio’s job is to inform people of those services to help make the connection for better relations. While melodies of the band The Old Hippies played in the background, children played in the street and drew pictures with sidewalk chalk as their adult counterparts reacquainted themselves with their neighbors. “This is our ministry. This is our city,” Ohlson said. posted by Michele Lawson in community, food, Care-A-Van Ministries, cookouts, meals. Care-A-Van Ministries has been holding a free community cookout every Thursday night at Austin Park since mid-May and the response by the community has been tremendous. On average, the ministry serves between 350 – 450 meals per event to local community members, seniors from Washington Towers, and families who are enjoying the spray park. But the event is not only about the food! It is about sharing the love of Jesus Christ with those in the community through uplifting music from the all-volunteer Care-A-Van worship team, inspirational words of encouragement from Pastors from various churches and denominations in our local community, and the commitment of local organizations such as the Salvation Army, Total Freedom, Truth Ministries, Living Waters Apostolic Ministries, P.C. Publications, Fidelis Care, GCASA, Mothers Supporting Children and Families, and many others in joining together to meet the needs of their community members. Ride to Recovery, an organization devoted to reaching youth in need through biking events and activities, provides free bike repairs on Thursday nights. A favorite with the kids is the YMCA and Eagle Fountain Fellowship’s Care-A-Van kids which provides a bounce house, children’s messages, and activities during the evenings activities. Volunteers provide face painting, caricature drawings, and many other activities for the children in attendance. Anthony “Smokie” LoCastro has brought a large donation of rain boots to the park which has provided free footwear for several hundred individuals within our community. Most importantly, Care-A-Van wishes to thank all their committed, consistent, and faithful volunteers, because without them we couldn’t put on these cookouts week after week. We encourage any organization, church, or agency to come out on Thursday night and join in this exciting outreach to our community members. For more information you can contact Paul Ohlson at 343-0328, see us on Facebook, visit our website at cavministries.org, or email us at [email protected]. posted by Robert Brown in Batavia Downs, community, Buffet, celebration, GCLP. The Genesee County Libertarian Party sponsored Buffet & Free Play: A Community Celebration will be held at Batavia Downs Gaming, 8315 Park Road, Batavia, NY. Admission to the celebration is by advance ticket purchase only. Tickets are limited so purchase yours soon! posted by Patricia Hawley in Announcements, community, family, kids, yoga, wellness, kids activities. BATAVIA…Blue Pearl Yoga will offer free yoga classes to the community on Friday, February 21 at 6:00 p.m. These classes are suitable for all ages and skill levels. A DJ will provide music for this fun event. Light refreshments will be served following the class. A class for families will be held simultaneously on the 4th floor of the studio. Maryanne Skye will teach a class designed for fun and suitable for adults and children of all ages. Participants can expect light stretching and simple yoga poses that create a delightful flow of energy to an upbeat soundtrack. posted by Daniel Crofts in arts, community, GoArt!. Genesee/Orleans Regional Arts Council (GoArt!) held its Community Awards Gala last night at Terry Hills Banquet Facility. Honorees Linda Blanchet (Board of Directors Special Recognition Award), Patrick Burk, Lorie Longhany, Medina Sandstone Society (represented by Craig Lacy and Robert Waters) and Chris Busch are pictured. Bill McDonald, center, was another award winner. He performed for the event with "The Old Hippies" -- Jim Sweet, Kay McMahon and James Catino (Bill Pitcher, far right, is not a member of "The Old Hippies," but presented the award to McDonald). The other winners (not pictured) were the Holland Land Office Museum, the Le Roy Barn Quilt Project and the Mason Family. Assemblyman Stephen Hawley was Master of Ceremonies for this 12th annual gala honoring community members in Genesee and Orleans Counties who give of their time, talents and treasure to enrich the artistic and cultural atmosphere of their community. Patrick Burk was recognized for his contributions to community theater and, in particular, for giving the Batavia Players a new and permanent home with the Harvester 56 Theater. Norm Argulsky, who presented the award to Burk, credited him with introducing Batavia to "the idea of a theater season," which allows people to know ahead of time what shows will be performed over the course of an entire year. The Holland Land Office Museum was recognized for "enlivening local history and culture through exhibits, engagement and exploration" (as worded in the event program). Museum Director Jeffrey Donahue and Board of Directors Member Jim Dusen accepted the award. Jim Owen, also on the museum's board of directors, lauded HLOM for "keeping history alive in Genesee County." "It's very important that people don't forget our history," he said, "because without history our future might be pretty dim." Lorie Longhany was honored for her passionate commitment to sharing her love of art with "the young and the young at heart" (Longhany's words), inspiring many young people to pursue careers in the arts and many senior citizens to explore their creativity. Bill McDonald -- aka "Wild Bill" -- a local musician, was honored "for selflessly performing and promoting music and art, now and for the future." When presenting the award to McDonald, Pitcher called him "a genuine troubadour." The Mason family, a family of talented artists whose work has drawn national recognition, and whose paintings can be seen in buildings throughout Genesee County (including United Memorial Medical Center, Bank of America, and the Holland Land Office Museum), were awarded for their contribution to the cultural vitality of our area. Max and Jane Mason were to receive the award for the family, but they could not attend. Beth Carr accepted the award on their behalf. The Le Roy Barn Quilt Project, which showcases locally embroidered quilts on barns throughout Le Roy, received an award for "blazing a colorful trail to share (Le Roy's) rural heritage through public art." Linda Blanchet, former GoArt! president and recipient of the GoArt! Board of Directors Special Recognition Award, was recognized "for dedication, drive and direction in pursuit of shining a spotlight on the arts in Genesee and Orleans counties." It is worth noting that Burk, in his acceptance speech, credited Blanchet in a special way for getting him back into local theater after he had been away from the stage for 10 years. Chris Busch, a member of the Orleans County Renaissance Group, achieved recognition "for passion and commitment to bringing cultural experiences into the community." The Medina Sandstone Society received an award "for embracing the natural as a 'cornerstone' of culture, founding a tradition of community pride." Guests at the event included representatives from National Grid, Turnbull Heating, Air Conditioning & Refrigeration, O-AT-KA Milk Products, Roxy's Music Store, NYSARC and GCASA, among others. For more information on GoArt! and its programs and services, call 343-9313, e-mail [email protected] or visit www.goart.org. In his acceptance speech, Donahue mentioned that the museum now has the "V" from the old Batavia Downs sign. People who have driven by and seen it hanging for many years can now go to the museum to "see it in person," says Donahue. "Holland Land Office" by Lorie Longhany. "Hand-painted Autumn Leaf Pottery," donated by Kelly Kiebala. "Barn on Country Road" by Tom Zangerle. "Iris with Fence" by Dan Cherry. "Framed & Matted Print" by Brandi Bruggman. "School's Out" by Diane Phalen. "Halloween Wall Hanging" by Linda Kozubal.